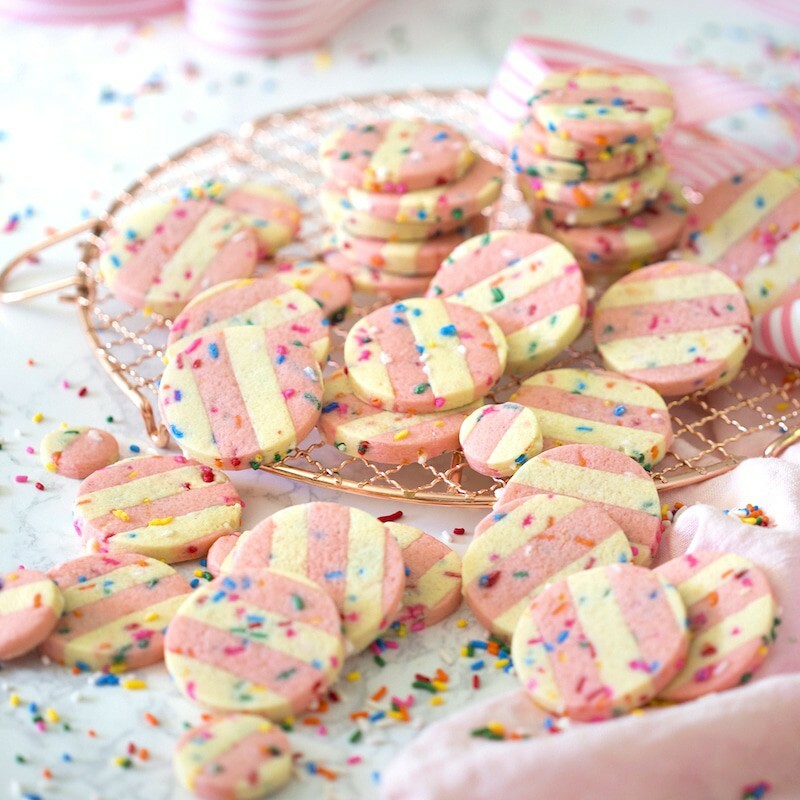 These striped funfetti cookies are almost too cute to eat; pink and white, lots of sprinkles, a dip in white candy melt and then more sprinkles! I cut mine into circles and loved the simplicity but any shape you desire and in case you’re wondering yes, dipping is totally optional; I loved the cookies both ways! They’re super-nostalgic and all those sprinkles are just so cheerful! I’ve made a few cakes and thought it was definitely time to branch out into cookies! Can You Put Sprinkles in Cookie Dough? You can add almost any kind of sprinkle to cookie dough with excellent results. Non pariels however are not the best option as they bleed and dissolve quite easily. Rainbow sprinkles have been around a a while but it wasn’t until Pillsbury introduced Funfetti cake mix in 1989 that a classic was born. Typically Funfetti is white cake batter with sprinkles but as their popularity has grown so have the permutations! I could have just made my no-spread sugar cookie with sprinkles in it but I wanted to add a few extra touches. 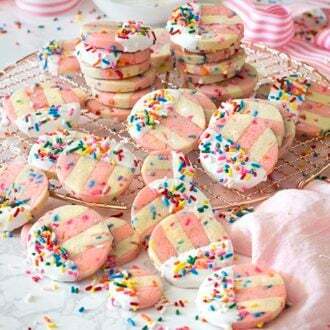 I had made some sugar/gingerbread candy cane cookies for Christmas and loved the striped look so I used the same laminating technique for a pink and white striped Funfetti cookie! You can definitely make these cookies in all one color but the technique is pretty easy and I love the visual! I think these cookies look great naked but I decided to give mine a dip in some white candy melt. White chocolate can be used if preferred, I know it’s more natural, but it can be finicky, burning quite easily, and it’s pretty yellow. That arctic white from candy melts really sets pops with the sprinkles. I’ve used candy melts in a few different projects and the taste was driving me crazy, it was so familiar! I KNEW I had tasted it before as a child but it took months to place it. Mother’s Cookies! Mystery solved and I don’t mind saying that I greatly prefer my version. If the cookie dough is warming up and becoming difficult to handle then place in freezer or fridge to chill until firm. It’s best to work on a sheet of plastic wrap or a pastry mat so you can move the dough to and from the fridge easily. You’re going to end up with a fair amount of scraps after you cut the cookies out of you’re striped dough. I used smaller circle cutters to use as much of the dough as possible, then balled up the rest, rolled it out and had some crazy looking but tasty scrap cookies for snacks. You can make this dough a few weeks in advance and keep it in the freezer, provided it’s well-wrapped. When you’re ready to use it just thaw a bit, cut your cookies and toss into the oven. For less food coloring try folding in toasted chopped nuts and you could use beet powder for the pink stripes. If you prefer the taste of white chocolate just chop then melt it in a bowl over lightly simmering water and dip the cookies. Be careful with the temperature as white chocolate can burn and seize up pretty quickly. I would also note that white chocolate actually looks pretty yellow so just keep that in mind. Preheat to 375 degrees F. In a standing mixer fitted with a paddle attachment, cream butter, vanilla and granulated sugar together. Sift flour, cornstarch, salt. Whisk until incorporated. Using a kitchen scale, split the 620 gram batch in half, each at 310 grams. Split 450 gram sugar/butter mixture in half, each at 225 grams. Add a few drops of pink food coloring to 1 batch of sugar/butter mixture. Mix until a desired color is reached. Add 1 egg to each sugar/butter mixture. On low, mix in dry mixtures to each batch. Add ¼ cup sprinkles to each. Mix for a few seconds. Transfer both to plastic. Give a gentle roll to incorporate sprinkles into the dough. Roll into a disk and chill for about 1 hour. Roll out to a 1/4 inch thickness. Using a ruler and a sharp knife, cut ½ inch strips. Layer pink and white stripes so that they are touching. Roll to create a seal. Transfer to the fridge to chill. Cut circles with a cookie cutter. Place cookies on a baking sheet lined with parchment paper or a silat. Bake for 12 minutes. Let cool. Melt about ½ cup candy melts. Dip the cookie and add sprinkles. Let the cookies harden. 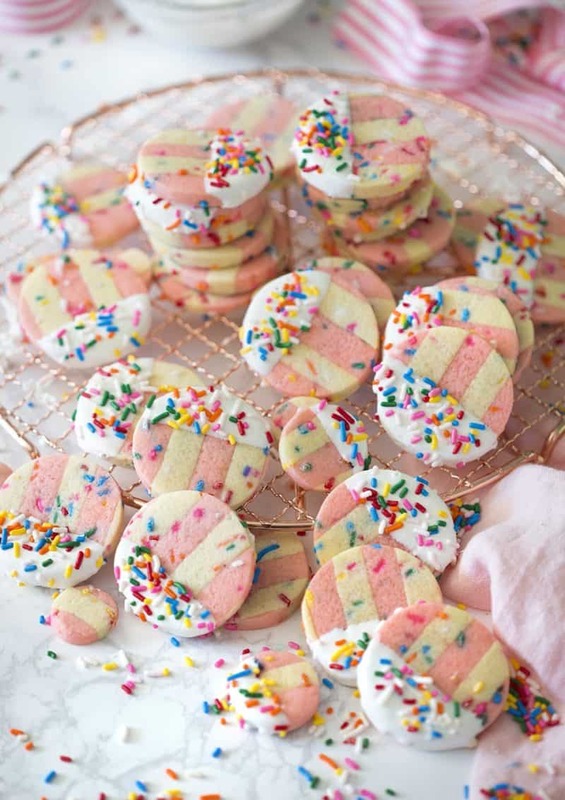 You'll fall in love with these cheerful and delicious striped Funfetti sugar cookies filled willed with sprinkles. In a standing mixer fitted with a paddle attachment, cream butter, vanilla and granulated sugar together. Sift flour, cornstarch, salt. Whisk until incorporated. Using a kitchen scale, split the 620 gram batch in half, each at 310 grams. Split 450 gram sugar/butter mixture in half, each at 225 grams. Add a few drops of pink food coloring to 1 batch of sugar/butter mixture. Mix until a desired color is reached. Add 1 egg to each sugar/butter mixture. On low, mix in dry mixtures to each batch. Add ¼ cup sprinkles to each. Mix for a few seconds. Transfer both to plastic. Give a gentle roll to incorporate sprinkles into the dough. Roll into a disk and chill for about 1 hour. Place cookies on a baking sheet lined with parchment paper. Melt about ½ cup candy melts. Dip the cookie and add sprinkles. Make sure to chill the dough. Cutting and moving the strips around is very difficult when things are at room temperature. Rolling the dough between layers of parchment paper or plastic wrap makes moving things into the fridge much easier. 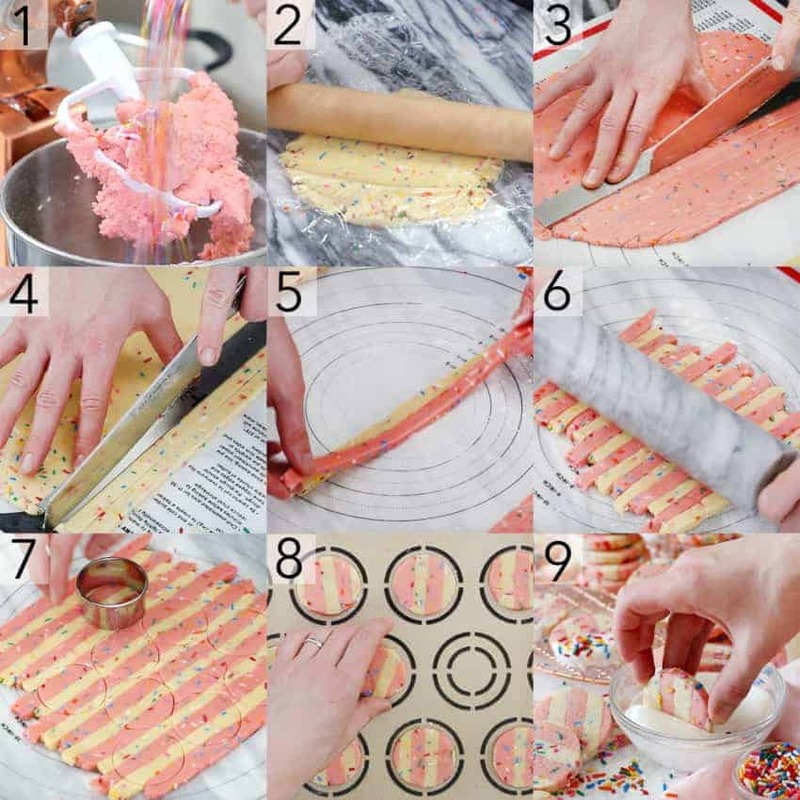 Roll all the straps up into a marbleized pink and white layer and cut cookies from this. Won't be striped but still pretty cute and delicious! IF YOU LIKED THIS RECIPE THEN TRY THESE OUT! I tired making this but the texture was off. The dough mixture was crumbly. It was hard to slice the flattened dough without it falling apart. where do you think i went wrong? I noticed that my strips of dough came together easier at room temperature! It could have been the temperature of your chilled dough! Would love a video for this! This is my first time making sugar cookies, is the dough supposed to be crumbly when you’re mixing the dry ingredients into it and then you roll it together to make it a ball of dough? The dough will come together while it chills! My dough was way too crumbly to even roll out after it chilled for well over an hour. I ended up putting it back into the mixer and adding a little bit of milk and then re-chilling it. It rolled out much better and the cookies turned out great. I made them using blue instead of pink and I used white chocolate as the dip. Did you weigh the flour before? Sometimes packing the flour will result in a crumbly dough! I made this recipe the other day and didn’t have any issues with the texture, but I’m so glad you made it work in the end! 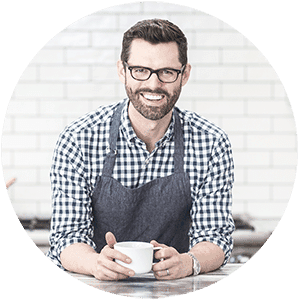 Instead of using granulated sugar is it possible to use caster sugar? Not that I know of. You should try it! These literally are FUN cookies. lol and yummy!